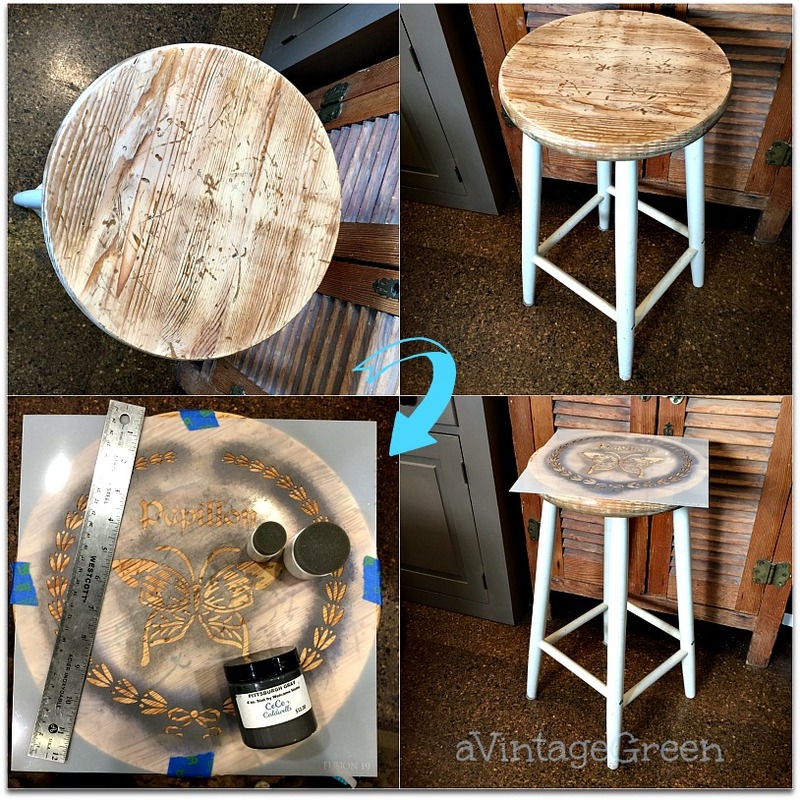 Well used vintage stool made attractive again. This vintage IKEA stool does not show up in their catalogue or in any searches (except one, in a corner of a room on Pinterest). That was enough incentive for me. First part of the job (and no before picture taken) was sanding off the old stool top finish. Next was finding a stencil to fit. 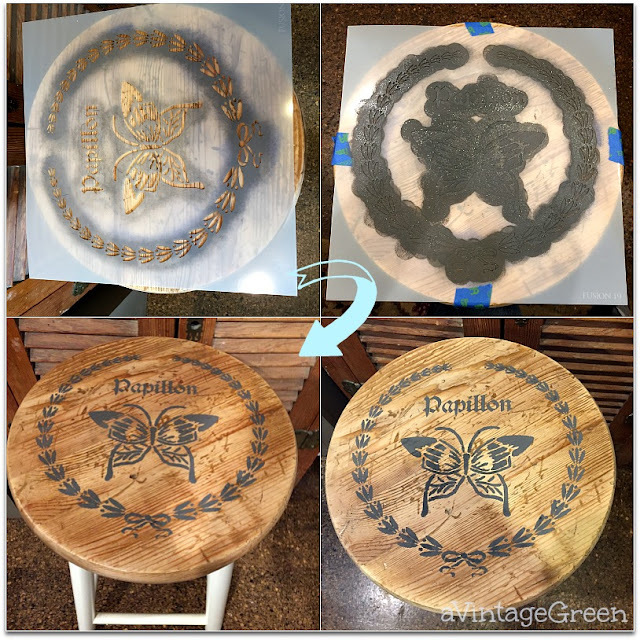 The stencil of a Papillon (butterfly) with a wreath (from Michaels) plus CeCe Caldwell Beckley Coal chalk-like paint, some blue masking tape and Martha Stewart 3/4" sponge pouncher were the supplies used for this project. Forgot to include this wonderful and very vintage tablecloth with the pink birds (salt and pepper) in my last post. After stencilling and drying overnight I gave the stool 2 coats of Varathane Crystal Clear Water Based, drying between coats. The water based Varathane was an easy 'brush' cleanup with soap and water. I took the stool over to my booth on Monday. I adore stencils! They transform everything beautifully. Great makeover Joy. 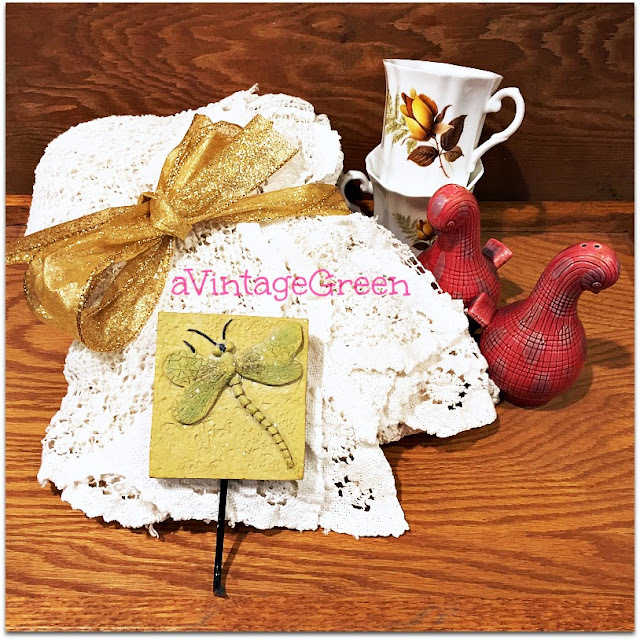 I love the butterfly stencil! Thanks for sharing with SYC. Oh how I love it! You make everything more beautiful! Enjoy your week! The stool came out terrific. I bet it is in its new home already. Well done! I had a yellow stool much like this when I taught school. I used it to sit on at the front of the glass when I needed to write on the overhead projector. Funny what sparks a memory! Thanks for sharing. Love the stecil you used. 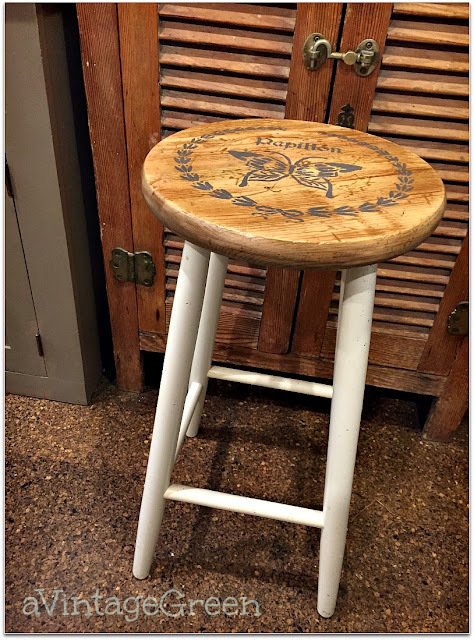 Once again, Joy, you've made something that I would love to own, if I lived in you area that little stool would no longer be waiting in your booth, it's so nice! Joy, Vintage IKEA is good stuff. The stool looks great. Have a good week. Sylvia D.
What a cute stool. Nice job. Love the stool. I really like the stencil you picked. Sold!!!! 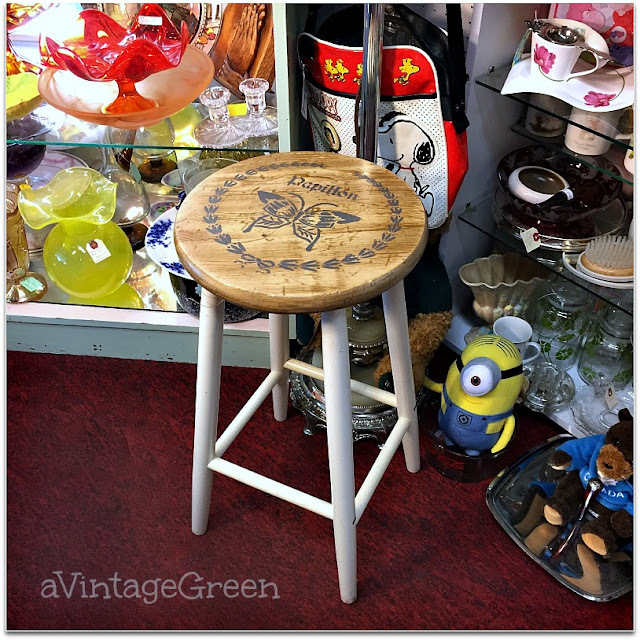 I love the stool too...and I also like the stencil you picked. I love using stencils and the look they provide. Another keeper ... for someone who wanders into your stall! Nicely done! I Love the raw wood finish and stencil design on your little stool, really makes it something special. Thanks for sharing your project at #FridaysFurnitureFix! This one wont hang around long in your shop! Turned out gorgeous! Thanks for sharing with us at the To Grandma's house we go link party! So cute. Great project. Thanks for sharing at Keep In Touch.